The event has been broadcast, we will share the slides and recordings in a few days. 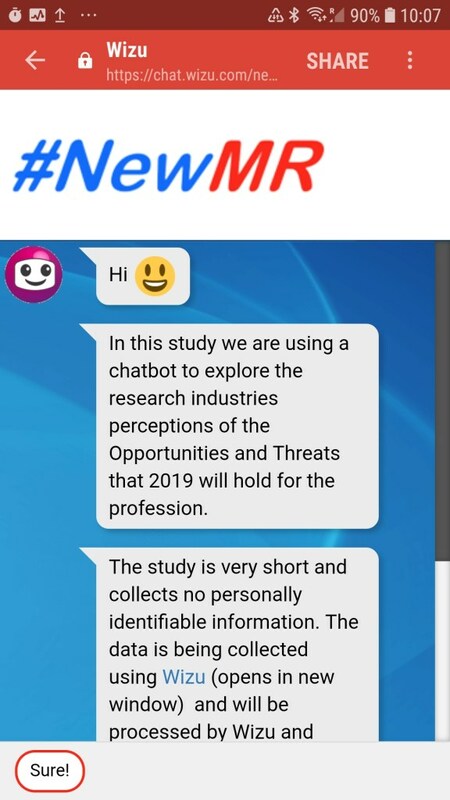 Earlier this year #NewMR and Wizu partnered to conduct an experiment with a chatbot. For our experiment, we conducted a chat survey looking at the Threats and Opportunities facing market research and insights. We were able to collect 336 responses from people involved in market research and insights, along with quite a lot of material from online discussions about the project. We are now inviting you to join us for our report back on the experiment. The webinar will consist of two sections. Sue York (NewMR) and Martin Powton (Wizu) will look at the feedback about the chatbot experience. Ray Poynter (NewMR) will report back on what the research said about the Threats and Opportunities facing market research. We will also share the NewMR written report in a week or so.